Collabro are the world’s most successful Musical Theatre group. In 2014 they met for their first rehearsal above a pub in London and just a month later went on to rouse the whole of Hammersmith Apollo into a standing ovation during their first ever public performance of ‘Stars’ for the Britain’s Got Talent judges. Having triumphed in their semi-final heat with over 63% of the votes, they then won the overall competition with one of the biggest majorities ever. This subsequently led to them joining Simon Cowell’s label Syco, and hence becoming label-mates with the likes of One Direction, Little Mix, Susan Boyle and Il Divo. 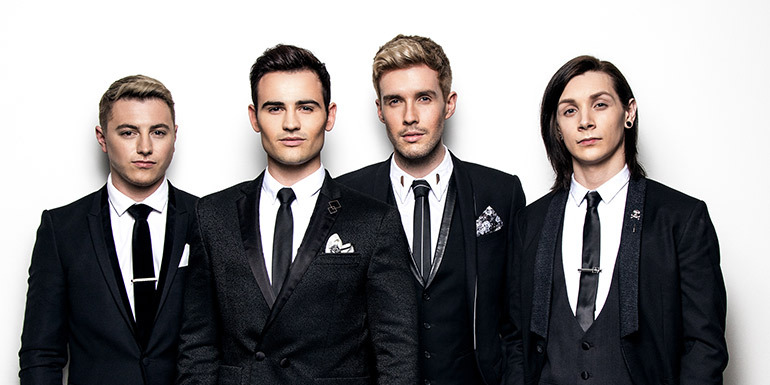 In the years since the competition, Collabro have released a Number 1 debut album Stars, followed by Act Two which peaked at Number 2 in the charts in the summer of 2015. They performed at the Royal Variety Performance; twice on Britain’s Got Talent (most recently the 10-year Grand Final compilation of past contestants – having been voted ‘The Nation’s Favourite BGT Winner’ in a national poll) and are now enormously successful internationally. Notably, they have performed for over 30 million people in Japan on Music Station on two separate occasions – receiving a Gold Disc for Best International Artist alongside Sam Smith and Meghan Trainor. They have also completed two tours of America and signed a major US record deal. Collabro were originally Jamie Lambert, Michael Auger, Matthew Pagan, Thomas Redgrave and Richard Hadfield. In 2016 Hadfield announced he was to leave the band in pursuit of other projects and his other band mates wished him well. Since then, Collabro – now Matt, Tom, Jamie and Michael – have already performed to 7 million people on Soccer Aid 2016 to critical praise and garnered excellent press reviews for their first performance as a four piece. The Cork World Book Fest turns 15 this year and the programme is more exciting than ever. The Fest runs over five days from 23–27 April, with workshops, readings, family friendly events, a book market and more all taking place between Triskel, Grand Parade and the City Library.